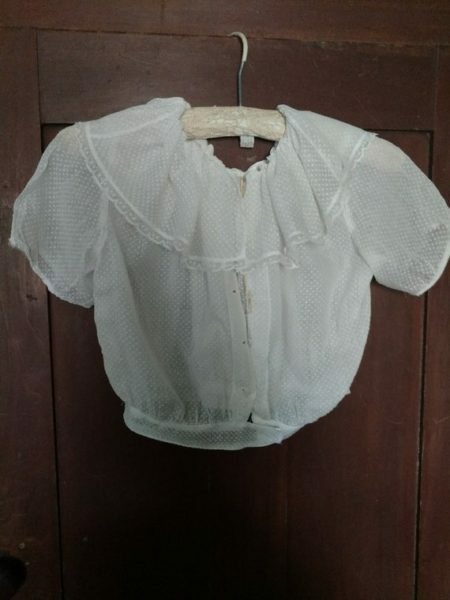 An Edwardian little girl’s sweet dotted Swiss blouse or bodice. Suitable for photography, costuming or display. A wide ruffle collar and tiny crocheted buttons accent this blouse. A silk ribbon drawstring adjust the fit at the neck line. Collar is edged in narrow lace. Short sleeves, which also had been edged with lace at one time. Buttons down the front with 5 buttons.